Coffee prepared in a French press is known to be a morning favorite amongst coffee connoisseurs. 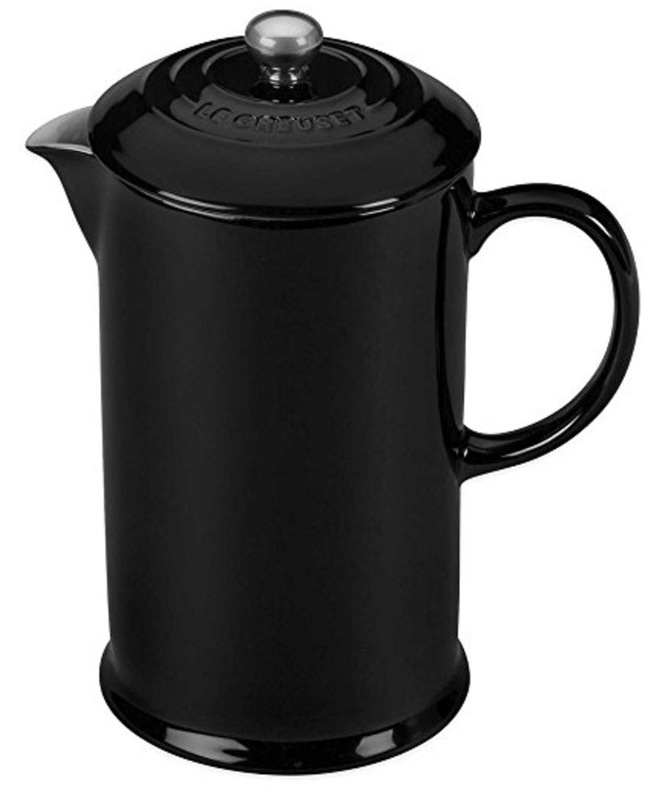 In order to pour that perfect coffee, Le Creuset Stoneware French Press will be the best choice for you. This ceramic French Press allows you to prepare the perfect coffee for any occasion and the beautiful design will blend right in with all your kitchen ware. Using a glass French press has quite a few flaws when it comes to enjoying a hot cup of coffee. If you’re the kind of person that likes to brew a big pot of jo’ for yourself, you’ll find your coffee getting quite cold very quickly. Having a ceramic coffee maker allows you to prepare coffee and enjoy it for a greater part of the morning. If you’re curious about the science behind this, convection is the process of heat loss when it is in contact with air. Glass has a lower ability to retain heat than that of a ceramic French Press. This means, you can enjoy a steaming hot coffee a lot longer. Where to start. You already know that ceramic is better than glass, but what more could Le Creuset French Press provide? The stoneware made by Le Creuset is some of the best in the business. The company has been producing ceramic products since the 1920s and they are professionals at their trade. 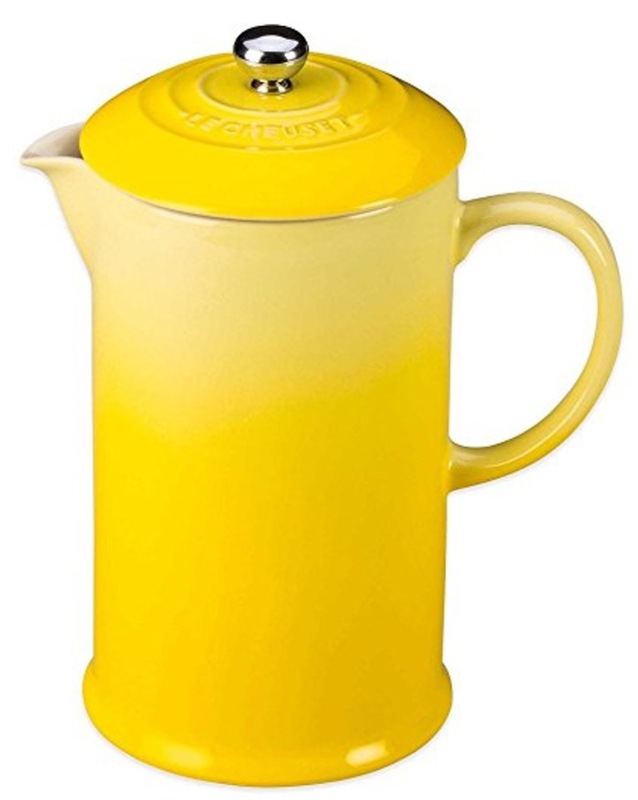 This ceramic French press includes a non-porous enamel finish which resists odors, staining, chipping, and cracking. If you are the kind of person that uses a metal French press to prepare coffee and other hot beverages, you might find lingering odours and residue from previous washes. You won’t have to worry about that with this French press. As well, the exterior is coated in the same resin which resists staining and scratching from metal. 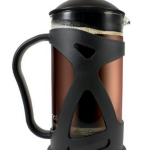 This allows your French press to be dishwasher safe making your life so much easier. Le Creuset Stoneware French press is only 27 oz. This is considered good to brew 4 cups of coffee. However, every coffee drinker has a different sized cup. Realistically, this French press is perfect for one who enjoys multiple cups or shared with a partner. If you’re seeking a French press with a bigger size, you might want to check out one of the models in our Best French Press Review article. While ceramic is certainly stronger than glass, you shouldn’t try testing how strong it is by dropping it on the ground. Enamel can chip and crack if you drop it or bang it against a hard surface. Do not use steel wool or other steel based bades. This can destroy the enamel finish. Do not use harsh detergents or abrasive cleaners. For the same reason above, use delicate soaps and soft pads for cleaning. One final note is to keep your Creuset Stoneware French press away from stovetops and open sources of heat. This can cause significant damage and can even cause unwanted cracks. 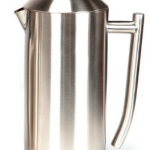 Included with the ceramic French press is a stainless steel plugnerset. The plunger system is very simple to remove and easy to clean. Some say there are issues with the press, but if you’re not in a hurry and push the plunger down slowly you’re sure to get a delicious coffee. This is one of the most simple coffee making systems on the market and the design is flawless. People who have purchased this French press have been more than pleased with their experience. Certainly a ceramic style is not for everyone. However, for those who enjoy a hotter coffee from a fancy and well polished press, you should definitely get one for yourself. Waking up and not being able to brew your much depended upon hot drink is certainly frustrating. The durability and strength of the Le Creuset Stoneware French press ensures you can enjoy your drink every morning. 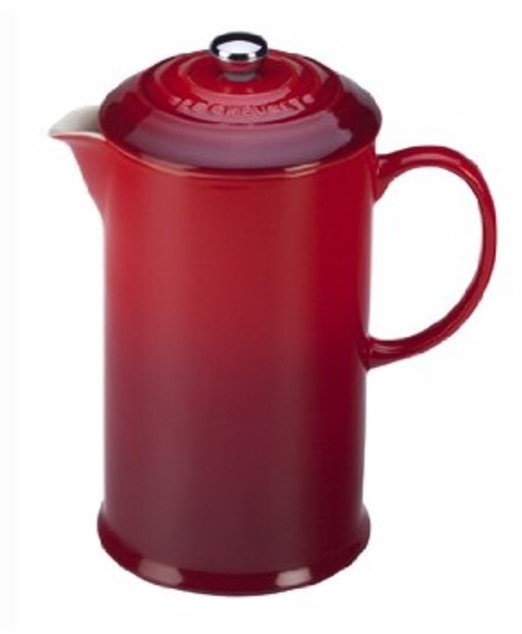 Le Creuset is one of the best makers of ceramic coffee makers. Their aesthetically pleasing enamel finish adds a beautiful glossy look to your household.